It is very simple to exclude a page or pages from the cache. 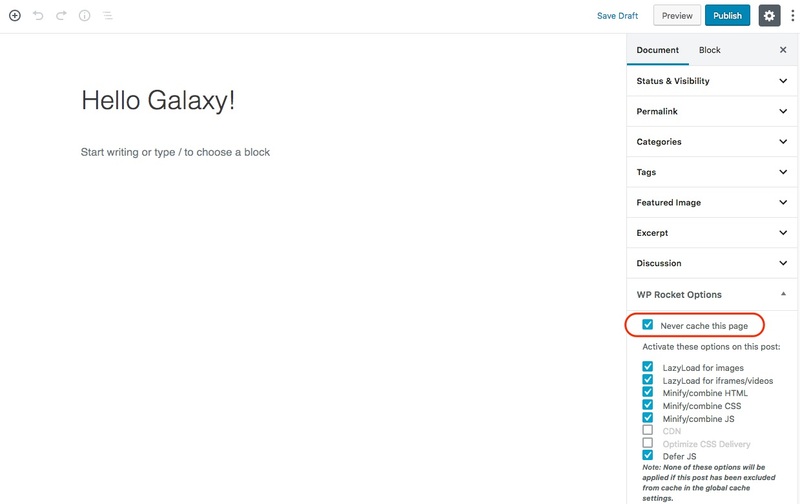 Note that WP Rocket automatically excludes cart and checkout pages for certain ecommerce plugins. Read more about that here. Go to WP Rocket Advanced Rules tab. Locate the box Never cache (URLs). Enter the URL of the page you wish to exclude. You can either enter the full URL e.g. http://www.example.com/page/ or you can just enter the part after the domain name, e.g. /page/ . Either way will work. Should you use the trailing slash? Whether or not you include a trailing slash at the end of the URL depends on how your site is set up. You can go to Settings → Permalinks and look at the structure you are using. If it ends with a slash (/), such as /%postname%/ (which is the most typical), you must include it when adding URLs to this box. You can use simple Regex to exclude a specific set of pages. This would exclude the page /events/ itself, and all the pages with events/ in the URL, like for example /events/your-event-here/.